The heat map feature in DEWALT’s HangerWorks, shown here, was perfect for communicating the areas of impact to the slab loads resulting from the coordination process, ultimately saving Spaeder weeks of time in hanger layout. Because of an experience with structural failure caused by overloaded slabs, the engineer for this project was determined to be particularly cautious about the loads added to the slabs as the mechanical and electrical systems were coordinated for the building. At first, the engineer wanted to avoid any attachments to the slab. After discussion with the construction management team, the engineer gave Spaeder an alternative. They would be permitted to hang from the slab as long as they used concrete embeds prior to the pour and could demonstrate to the engineer’s satisfaction that they had met specific criteria. The engineering criteria were not as simple as circles or squares surrounding each embed location. The criteria represented accumulative loads for a section of concrete 2’ wide and extending from one beam to another at every hanger location. The engineer gave Spaeder maximum weights for areas of overlap and even specific criteria based on distance from beams. These demands could have posed a giant engineering nightmare, because the building needed approximately 25,000 hangers embedded in the slab. In fact, the criteria were so complex they required three pages of explanation. 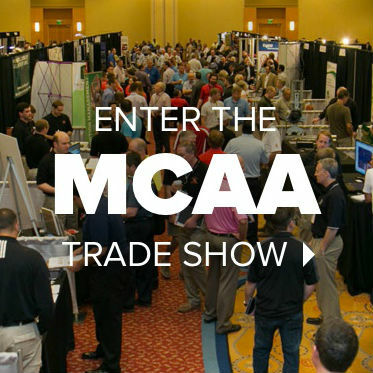 The challenge was presented to three separate subcontracting companies, who also needed to find a way to come together and work out the best available slab loads to accommodate all the building systems. Finally, all of this coordination, design, and planning had to happen fast. Construction of the building had begun, and anything in the slab had to have an embed installed prior to pouring concrete. DEWALT’s HangerWorks software is a plug-in for Autodesk Revit™ that automates the placement and design of hangers and seismic bracing for mechanical, electrical, and plumbing (MEP) systems. Complex engineering calculations are built in to the tool that enable it to size hanger assemblies based on the weights of the MEP system, including contents (e.g., water, wire, or air), and determine hanger locations based on building code requirements and user-defined project standards. With HangerWorks, Spaeder tackled two critical problems. Spaeder modified the heat map using HangerWorks, attached it to the various hanger rods throughout their model, then gathered load data to demonstrate to the engineer that all the criteria had been met. Second, HangerWorks succeeded in communicating the slab loads graphically in a way that everyone could understand and that alleviated the engineer’s concerns. 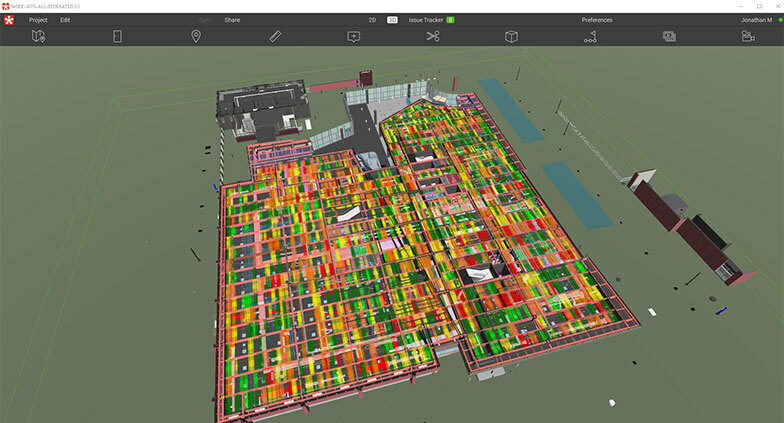 The heat map feature in HangerWorks proved to be the perfect tool to communicate the areas of impact to the slab loads resulting from the coordination process. While the criteria given to Spaeder by the engineer were too complex to allow for use of the out-of-the-box heat map, Spaeder used HangerWorks to create a modified heat map, which they attached to the various hanger rods throughout their model. Those rods then provided individual load reports, allowing Spaeder to successfully demonstrate to the engineer that all the criteria had been met. 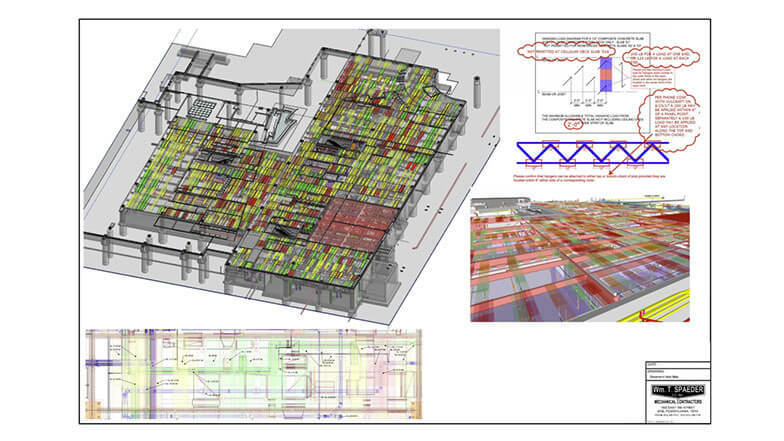 Moreover, the HangerWorks heat map provided a guide to enable the building owner to make good decisions about future installations within the building. “Upon creation of our first heat map and presentation to the engineer, Spaeder received applause from the owner’s representatives and members of the design and coordination team for having met the challenge and been able to pull together a workable solution,” said Marsh. Had DEWALT HangerWorks served only to provide engineering calculations, it would have been well worth Spaeder’s investment, Marsh observed. HangerWorks also delivered on the prefabrication side, enabling Spaeder to automate their BIM of materials, hanger spool sheet, and prefabrication labels. By quickly modifying their existing hanger fabrication workflows to work in conjunction with HangerWorks, Spaeder leveraged the software’s enhanced reporting functions to produce better labels, improved fabrication drawings, and more useful field installation drawings. The drawings included information vital to the foreman’s understanding of the installation process and helped with sizing of strut channel and other secondary support materials. In addition, Spaeder ended up being paid to lay out fire protection and sheet metal anchors, as they were already controlling the hangers for all the trades on the project. For more information, visit anchors.dewalt.com/anchors.